Another fake letter is doing the rounds in South Africa. This one is allegedly by Richard Branson (except it’s not) and it differs from the Trevor Mallach letter in that it appears that it was written as satire here, rather than just being attributed to an (apparently random) individual in a position of responsibility. Of course, that means that those arguing against the EFF’s policies in the future can triumphantly cite Richard as one of their team. Even though he had nothing to do with this “open letter”. …even if it’s a hoax, it’s absolutely hilarious and clever. But I’m not sure that that partial disclaimer makes it OK to continue to portray the letter as Branson’s work, just because you can’t find the original source. This is not breaking news, it is a few weeks old but oh my goodness it is good! This is an absolute gem, and definitely deserves a second read if you have read it before. Sir Richard Branson is just genius…Most people would respond with indignance – not him. His response is classic! Ten out of ten on the hyperbole there. I almost wanted to read the whole thing again. It seems to me that the unacceptable practice of propagation of deliberate falsehoods to attain various objectives is becoming entrenched in our country. Firstly, use your brain. 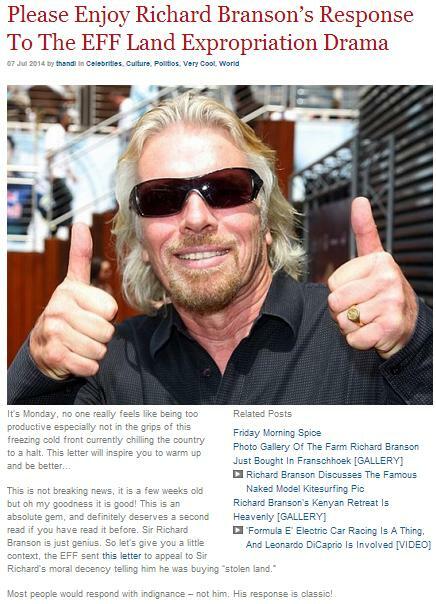 What is the likelihood of Richard Branson actually having written this? Really? That’s right, it’s pretty much nil. There should be alarm bells all over the place. Next up, do your research. It’s really not rocket science. I used “Google” to find the original of this letter. 2oceansvibe relied on an unreferenced piece from micampusmag.co.za. The hysterical Afrikaners on Facebook apparently didn’t even bother give us a source for theirs. And again. Stop attributing these words to someone just because of their name or position and the way that it fits your agenda. This letter isn’t being shared because of its content, but rather because of who “wrote” it; the convenient notion that someone big and powerful is kicking back at the renegade upstarts of the EFF. Don’t get me wrong. I know that this won’t change a think. I know that 99% of the general land-owning population will continue accept that Richard Branson is their saviour who will fight the EFF until he dies has to sell his hotel, but if I can just reach that 1%, then my work here is done. 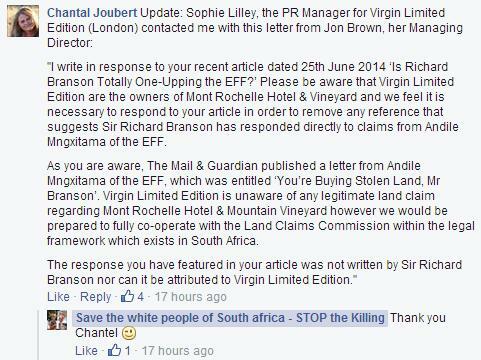 DISCLAIMER: This is a comment on the veracity of the letter in question and the intelligence and diligence of those sharing it, not a comment on the policies of the EFF or anything to do with a posh hotel in Franschhoek. There will be people – probably not within the target market (such as it is) of this blog, but still there will be people – who will want to join Julius Malema’s Economic Freedom Fighters (EFF) party. EFF encourages fighters to use the FNB ATM to depositing membership fee as opposed to doing it inside the bank. Fighters across the country must guard at all times against being taken advantage of by any system. The membership fee must, as much as possible, contribute to the sustenance of the organisation we all love. Damn those greedy financial capitalists and their 80% fee structure. Believe me, they’ll be the first up against the wall. Screenshot available here for posterity.